When the USC Kid Watch program was launched more than two decades ago, the area surrounding the six Family of Schools was a far cry from today’s bustling corridor (prior to the Galen Center, the USC Village, the Expo line, Banc of California Field) and the children walking to and from school on their own were susceptible to street crimes and other safety issues. The goal of the program was to keep children safe by empowering the residents of the neighborhood to become a formidable neighborhood watch. Neighbors would look out for children as they walk to and from school, in the morning and afternoon. 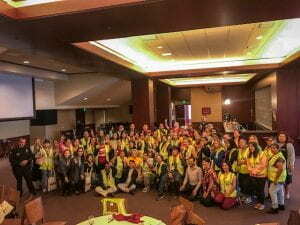 The safe passageways created by Kid Watch ambassadors, as the volunteers are referred to within the program, prevent bullying, and gang influence as well as deter street crimes. Over the years the program has evolved as street crimes in the area surrounding Norwood Elementary, Weemes Elementary, Vermont Elementary, Mack Elementary, 32nd Street Magnet and Foshay Learning Center has subsided. 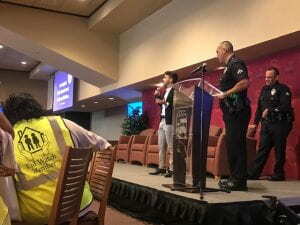 Street and traffic safety has become a focal point of the program. The Kid Watch safety valet program was introduced to create a safe environment in designated drop off locations. While the goal of the program is to ensure the safety of children, it also empowers the community members who volunteer their time. They are empowered through training and information sessions that teaches them skills such proper reporting protocols and self-defense. 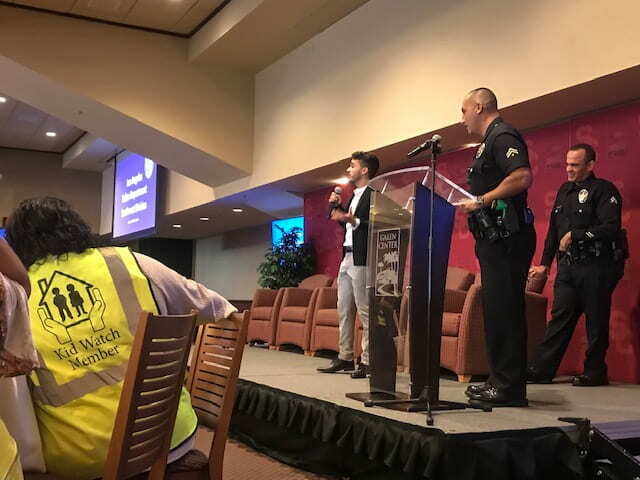 At a recent public safety conference, the ambassadors were introduced to various safety partners in the program, including USC’s Department of Public Safety, the Los Angeles Police Department (LAPD) and the Los Angeles County Metropolitan Authority (Metro). The enduring history of the program is due to its successful collaboration between the community, parents, schools and safety partners with the goal of keeping children safe by getting neighborhood residents involved.